The service offered by you and your team is first class. Nothing was too much trouble. Coupled with the very competitive rate for the work, we have no hesitation in recommending you to our friends and family. Excellent workmanship, I could not be happier. I needed new gates and fences, Mr Jones provided invaluable advice when he called to view the job. Highly reliable and efficient, if you need a 1at class job done at a reasonable price then look no further. I would highly recommend and would use no other business. My gates and fences are perfect and the site is as clean as it was before the job was started. A very big thank you to Mr Jones and not forgetting the brilliant Boris.,Excellent workmanship, I could not be happier. I needed gates and fences fitted, Mr Jones provided invaluable advice when viewing the job. If you are looking for a 1st class job from a highly reliable and friendly business at a good and fair price then look no further. I would highly recommend and would not use anyone else. You and your team take such an obvious interest in our garden and clearly take a real pride in doing a really first class job. Our garden has genuinely never looked so good! In the time we have known you, we feel we have found real partners and friends in the development and care of our garden and I wouldn’t hesitate to recommend your services to others”. With gardens as big as ours, we needed someone with the expertise and enthusiasm to cope. This they have in spades. Sorry about the pun. But this team are highly skilled in all manor of garden maintenance and I can't fault them. 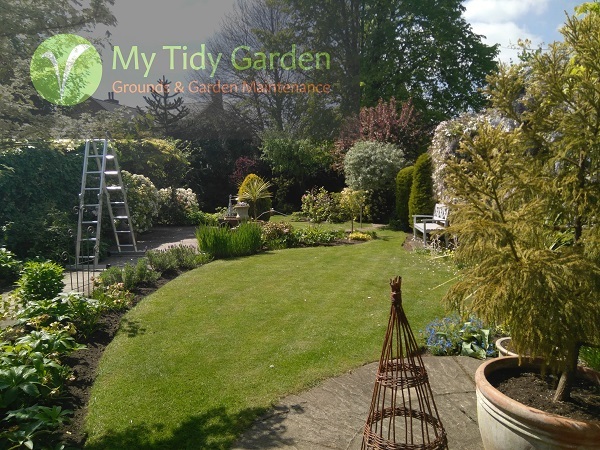 My Tidy Garden have been coming to me over the years and are always pleasant, efficient and polite. They always do exactly what I want. I would recommend them to anyone. my hedge for last 5yrs with no issues, The team does an excellent neat job at a reasonable price.